ALL Crane also purchased the series 1 (first off the line) Manitowoc 14000, pictured here in 2006. Strengthening its hand at both ends of the lifting market, the ALL Family of Companies began the final quarter of 2016 announcing the acquisition of an equipment package consisting of large-capacity crawlers and aerial lift equipment, including boom lifts and telescopic forklifts. The two separate deals with leading-brand manufacturers Manitowoc and JLG will include 30 new machines. The Manitowoc purchase includes two 275-USt Manitowoc 999 crawler cranes. 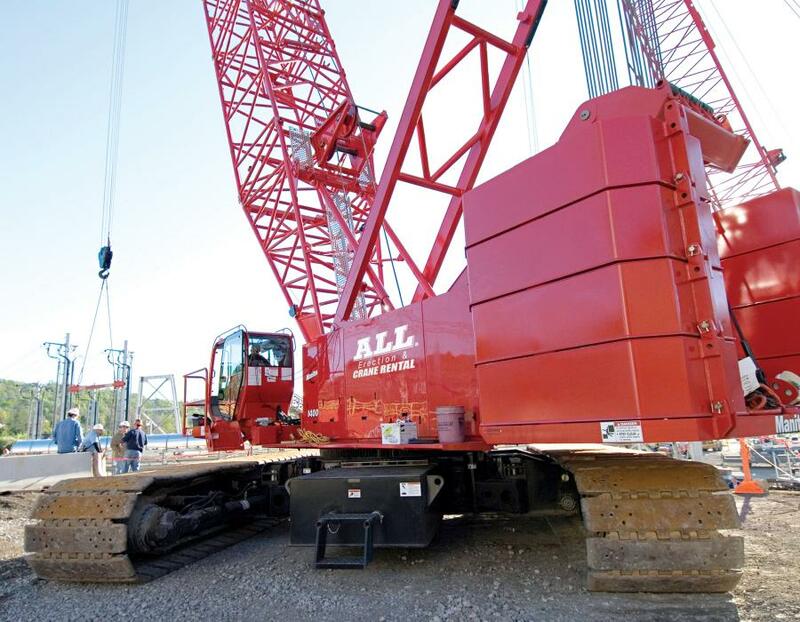 These crawlers are a perfect combination of capacity, reliability, and versatility, and are in such high demand that one of the new cranes will head straight to a job in Ohio. Also joining the crawler fleet is a new 220-USt Manitowoc 14000. With its long reach (up to 462 feet with the luffing jib attached), this is an extremely versatile crane. “We are using them in steel mills, power plants, water treatment plants, wind farms, and many types of new construction. They can set steel and precast concrete, among a wide variety of other applications,” said Michael L. Liptak, president of ALL. ALL Aerials, the company's nationwide aerial equipment division, continues to experience strong demand for their varied inventory of equipment. The company's new JLG package includes 17 telescopic boom lifts, with horizontal outreach ranging from 33 to 80 feet, as well as 10 JLG telescopic forklifts (telehandlers). These range from the JLG 642, with a maximum capacity of 6,600 pounds, to the heavy-duty JLG G15-44A, the largest of JLG's telehandlers, with a maximum capacity of 15,000 pounds. Telehandlers and boom lifts are maneuverable, efficient machines that offer real advantages on crowded job sites. Their power, versatility, and ability to work at awkward angles can directly and positively affect productivity. For more information, visit www.allcrane.com.